“This tb2 was bought on ebay in 2010. I took a chance on it even though I could tell little about it due to the poor photographs and description. When I received the instrument, it was in even worse shape than I could have imagined. The metal was highly rusted, very dirty, and it looked as if it had been stored in a barn in an open case for many years. To top this off, someone many years ago had oversprayed the resonator with a thick ‘goop’ of some kind! My first chore was to completely disassemble and give the metal parts a good cleaning. 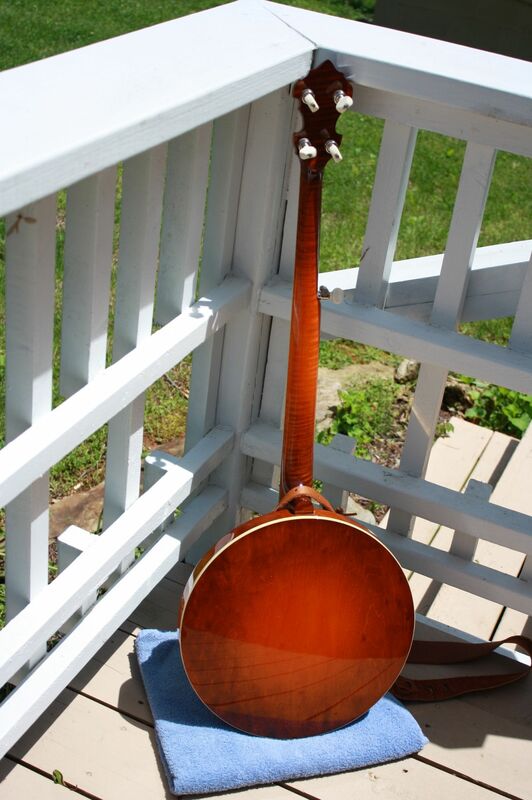 The grooved tension hoop, bracket shoes, flat hooks and nuts, diamond flange, arm rest, tail piece, and half inch nickel silver hollow tone hoop cleaned up fairly well – especially the arm rest (now on 8259 – 49) and tail piece. 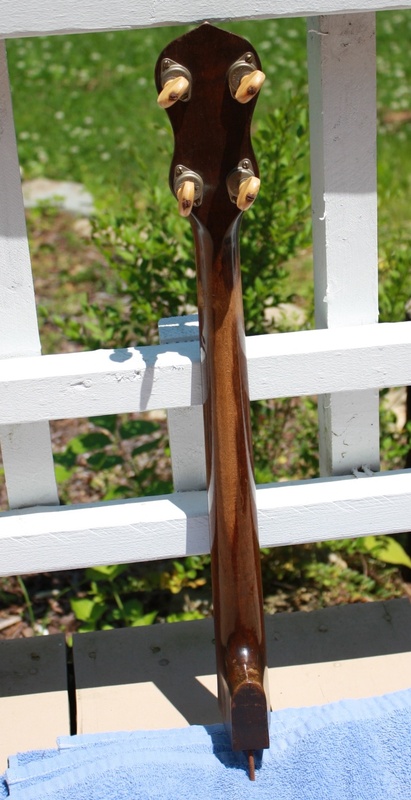 The tenor neck (complete with original tuners) was set aside to be available with the conversion. The resonator was another story. I decided to have it refinished and the results were outstanding. 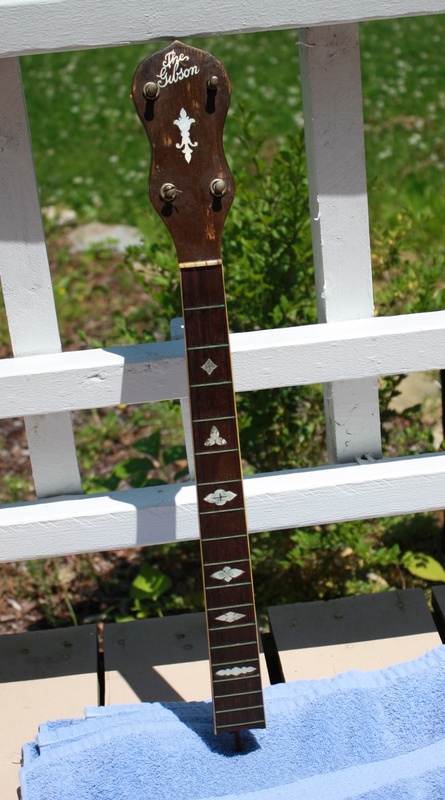 Since the resonator was refinished, I decided to have this conversion feature a curly maple neck with an older version of the ‘hearts and flowers’ inlay design, a Recording King one piece flange (as opposed to keeping the bracket-shoe construction), one of Arthur’s gold plated 20 hole flat head tone rings, and modern Prucha hardware. 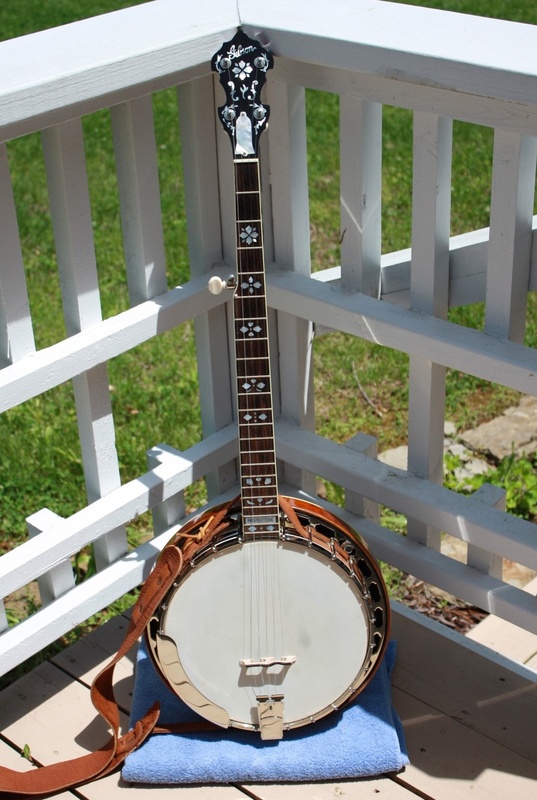 To me, the best sounding maple banjos have rosewood fingerboards and gold plated flathead tone rings – something like the Granada design without the engraving and additional gold plating.